Why do you think it took Bert “No Nickname” Blyleven so many years to get into the Hall of Fame while Andre “The Hawk” Dawson waltzed in? Because Dawson had a cool nickname. Nicknames are a lost art. You’d think that in an age of myriad user names and social media handles, our nicknames would’ve evolved, too. Instead, we get monikers a baby could come up with: “A-Rod,” “Tulo,” “Han-Ram,” “CarGo,” and so on. I’d rather root for professional bowlers. Back in the day, baseball players were paid very little money or sometimes no money at all, just sacks of cornmeal or the smallpox vaccine. Due to their poverty, they had endearing nicknames like “Shoeless” Joe Jackson or Clarence “Shovel” Hodge. Now that even the lowliest of major leaguers make nearly a half million dollars a year, you’d be hard-pressed to find a player so unrefined as to be seen in public with a gardening tool. That brings us to the young Michael Pineda. Still on his rookie contract, Pineda had an All-Star-caliber season last year while making a paltry $414,000 — making him a “Mansionless” Michael Pineda. My work here is done. 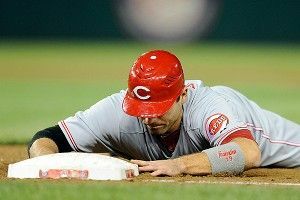 Given his latest über-extension, it’s tempting to simply call Votto “Joey Big Bucks,” “Canadian Bacon,” or “Vada Ving, Votto-voom.” Regardless of his nickname, though, the real intrigue is when you put him in the lineup with Jay Bruce. Should the Reds acquire someone like John Jay or Jacoby Ellsbury, they could call the heart of their batting order the “Violent Js” and win fans in the ever-growing Juggalo demographic. Or they could just ask Drew Stubbs and Brandon Phillips to change their first names to “J-rew” and “J-randon.” Either way would work. Here’s an interesting situation. Cespedes’s actual name is infinitely cooler than any nickname. Like Superman, who had to create the nerdy Clark Kent to hide his amazing superhero identity, Yoenis needs a bland alter-ego to mask his inherent awesomeness. The nickname should evoke, say, the short bald man who works in your human relations department — basically, the last person you’d assume would do this. I’m thinking “Glen” or “Norm,” or maybe “Leonard” (but not Lenny). WHAT IS UP, RICK ANKIEL? !